Not only that, but according to Alpha Quarry Products, the Alpha Key block is also easier to cut, track and plaster while it offers the lowest dry shrinkage figure on the market. – The easiest dense concrete block to cut on the market – The profile also gives an excellent start for cutting blocks, again much easier on the builder. – The easiest to track on the market – The profiles are an excellent start for the tracking process and the ideal depth for electrical conduits. – The best key for plaster on the market – The profiles are designed with tapered edges to hold plaster regardless of the plaster mix design. 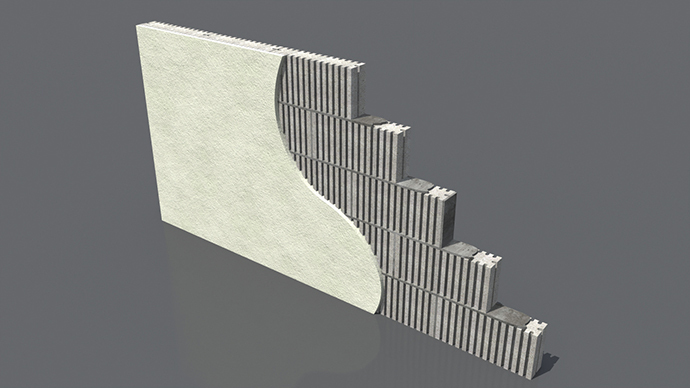 – The lowest dry shrinkage figure on the market – Due to the production method and additions used during production, the Alpha Key Block has the lowest dry shrinkage figure of any dense concrete block on the market, minimising the possibility of dry shrinkage cracking in your walls. Alpha Key Block joins an extensive product range from Alpha Quarry Products which includes eco-liquid screed; traditional floor screed; ready mixed concrete; building and plastic mortar; quarry stone/sand; concrete and masonry blocks; pumice block/brick; and precast/pre-stressed lintels.